Spike takes off to visit Jean and Skip. And Bridget and I go chasing after. In my haste to catch up with Spike, I leave the camera inside the BLT. A fun photo opportunity is missed as Jean and Skip’s Boston terriers, Sophie and Louie, come bounding out to meet their canine visitors. The crew and I go back another time and we three humans do our best to recapture in photos the excitement of the canines’ first meeting. Of course, now all four dogs are completely bored with each other and do their best to ignore each other. Spike and Sophie do take a moment to say hello. Spike, of course, has to show he rules. Some guest! Louie and Spike discover something interesting. And, of course, Spike forgets his manners, claims the discovery as his own, and is very rude to Louie. Hoo-boy. I say a quick goodbye to Jean and Skip and we retreat to our campsite. I laugh watching the crew trot along. “Gee, Spike, do you think we could go somewhere without you embarrassing me?” By the time we’re home, all is forgiven. I dole out kibble which is immediately scarfed down. Oh, I almost forg0t to tell you . . . While at Jean and Skip’s, Ivan drives up. Be sure to check the photos he posted on his blog today by clicking HERE. You can scroll down to aerial photos of Clark Dry Lake dispersed camping area with labels of some of the RVers campsites, as well as great slot canyon pics. Cat lovers will especially enjoy seeing Ivan’s header on his blog! Oh, yeah, something else . . .
Marie calls me over to their fifth wheel. I meet her husband, Wayne, and we visit a bit. Marie hands me a bag full of paperbacks . . .thirteen in all! And they look like good ones, too. I gave all the ones I’ve read to the PAWS Thrift Store so I don’t have any to reciprocate. Wow! Add that to the free Kindle books I’ve downloaded and I’m all set for reading material for quite some time. Gee, life is good. As pleasant as it is to camp here near the charming town of Borrego Springs, California, I think I’ll pack us up, hitch us up, and drive us out in the morning. When wind blows through this part of the world, it tends to start in the afternoon and evening, so an early start is in order. I’m going to try to spend Christmas in Ajo, Arizona. People who don’t understand what it’s like to be a loner and need privacy (like oxygen, food, and water) were offended. Sparks flew all over the comment section of this blog. I had to write a bunch of apologetic emails. I appreciate every one of the readers of my blog and I’m thankful for all the support I receive from my readers. If I bump into you quite naturally in the course of our daily lives, it’ll be fun to meet. I’ve certainly enjoyed meeting folks here while camped in the Anza Borrego Desert. Such good people! Just the same . . . I want to go back to Ajo to enjoy quiet, uninterrupted days hanging around home with Bridget and Spike through Christmas and New Year’s. Unless it’s windy tomorrow morning, the crew and I will head southeast to pick up Interstate 8 and then make our way east to Yuma. It’s always exciting to get back on the road again! Here are photos I took while Bridget, Spike and I were at the town park in Borrego Springs. The first photo is a creche set up in the gazebo in the center of the park. While I stand in front of the nativity scene trying to prevent Spike from urinating on the straw, a man comes along carrying a laptop. “Isn’t it great that the town put WiFi here?” He points to the peak of the gazebo. Hmm . . . Not only are the figures of the nativity made of plastic, instead of a bright star, we have WiFi drawing people to the manger . . . .
My intent with the next photos was to create our annual Christmas card for this blog. We encounter the same problem experienced by anyone who has ever attempted to capture the spirit of the season with Santa Claus and bored children. If Bridget and Spike aren’t running out of the frame, they look like they’d much rather be somewhere else. No, Santa hasn’t sprouted wings out of his head. That’s the angel looking down at Baby Jesus on the other side of the bales. So long for now . . . Next stop, Yuma! 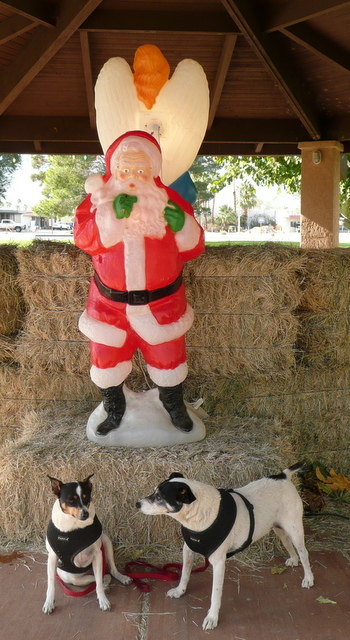 This entry was posted in Simple living and tagged Ajo, Boston terriers, dispersed camping, nativity, rat terries, RVing, Santa, WiFi, Yuma. Bookmark the permalink. And a safe travel to you on this the infamous Mayan apocalypse day. May you make your destination and enjoy the rebirth. So far, so good. It’s almost time for sunset on 12-21-12, we still have all six wheels on the ground, and I’ve got five bars on my air card. If this is the last day, it’s a good one! Have a great Merry and blessed Christmas and New Year, Sue! Wishing you safe travels! Been a long trip, but I have finally arrived at my brother’s in Tucson and will spend Christmas with them! I’m glad you made it safely to Tucson, Sunny. Have a wonderful Christmas with family. Wow Sue- the Mick/Sue camera catches ‘quick’ moments! Just a note…we were ‘warm and windy’ (name of a song I sent you featuring ‘mauve’ haha). Then it has been cold, even down LC way. Glad your pups like other pups. Brownie doesn’t mix. Pooh! Hope you passed on my note to Engineer Mick about the elec parts place in TX. I think I missed your note about an electric parts place in TX for Mick. Run that by me again, Bill. You’ve got no business going to Idaho in December! Ha! Merry Christmas to you and Kathy and pooches.! Try January! I checked Moab weather yesterday and it was 8 degrees! I buy all of my electronic parts for my tracking solar array from Mouser.com electronics in TX. They have everything under the sun (get it) and it’s wholsale. I thought Mick my like to have it as a resource, if he doesn’t already! Gooday to you Sue, Cheers br ps K is off doing family stuff…. Been using Mouser for decades Bill. My favorite since Digi-Key started charging me tax on internet orders. but offers a lot of what a desert is to desert appreciators. Go out the south route. Good suggestion, Rand! I did head south. Happy Christmas Sue and Crew! Our trailer group has ‘open’ and ‘closed’ signs… Since we do rally’s, people feel pretty free to come and gander at our oldie trailers. The ‘closed’ signs WORK. Maybe that would work for you… maybe a flag of some sort (welcome or not now please)… I appreciate my alone time as well, so I completely understand!!! Love your photos of the nativity!!! It is wonderful!!! Signs don’t work because it’s a shared road so people come up the road and, all of a sudden, there I am by myself. And usually I’m outside. Have a memorable, happy holiday, Barb. Looks like Spike wanted to play with Louie….kind of. Neat how you captured the dirt flying and Louie scurrying away. You shouldn’t feel you can’t stay in a place you love. I have to agree that some folks don’t understand those who like their privacy. Why should you apologize for the way you are? Anyone who reads your blog knows better than to show up outside your BLT unannounced. Up here…people are very intrusive. First off, people don’t lock their doors…home or not! Secondly…they think if they knock once..they can just come in. We came from Calee….ALL doors are locked ALL the time. People call before they come over…”dropping in” is not polite. What happens if we aren’t in the mood to entertain? Folks think we are weird….oh well..don’t let the door hit you in the arse on your way out! Live life for you….don’t settle for something less because you want to please others. I love the large picture of Spike, Bridge and Santa. Spike may look like he wants to play. That’s because you don’t hear the accompanying snarl. He can be very possessive. Glad you like the photo. I think they’re all pretty pathetic myself. Thats the price of success Sue. Your life will never be the same again. Go with it, or try a disguise. Doris Day use to wear a scarf and sunglasses and you would never know it was her. Why? Because in real life she was a red head with tons of freckles. If you keep it up you just might get a star on Hollywood Blvd too. If I were accepting the kind of money Hollywood stars take in, I’d be happy to have a drop-in visitor every day! I don’t know about Ajo, but it has been windy in Tucson. Yuma is always windy, I lived there for 7 years. Hope you have a safe trip and enjoy Ajo. We were on the road toward Yuma and luckily did not have to deal with wind. I don’t know what kind of wind we’ll have tonight but at sunset it’s calm. I have been in Yuma now for the past 12 days and only two of them were what I would call windy and neither of those two were all day blows. Great to hear that, Ed! We had some strong wind, especially at night, in the Borrego Valley. Maybe it’s a wind tunnel effect. Strangers, except for blogisphere, just passed each other once again! I don’t understand your comment, Nan. Nice to hear from you though. I love the last picture of the pups with Santa…too cute. Safe travels to you and the crew. Thanks, Ginger. And you be safe on the roads, too. Try doing a search for “Roadtrip 2013: Chillin’ in the Desert near Borrego Springs” — I tried clicking the word HERE in the blog post and it worked. The first thing you see is a big yellow tabby cat lying on the dash . .. Good luck. Safe travels when you do head out. Hopefully, you will get to have a relaxing holiday. Happy Holidays! Love the pictures of the dogs. Best wishes to you, too, for happy days ahead. Thanks for writing. I do want to cross over for teeth cleaning. I need to work on getting an up-to-date passport. This information is very helpful, John. I really appreciate you taking the time to explain it to me. I’d need to find someone to watch the crew while I’m gone. I’m sure I could work something out. I forgot from above post, when getting off the interstate from Yuma onto the road into Los Algodones is a “stop sign trap” where the local gendarmes from the US side hide behind some rocks on your right as you roll up to the stop sign before turning left onto road to Los Algodones. If you fail to come to a complete stop there they will swoop down and will ticket you. They did it to me. I was going on to spend a couple months in California but after that distasteful adventure I never did but stayed in Arizona and spent my money there, I don’t regret it! It was fun meeting you Sue, Hope you have a peaceful Holiday Season. Merry Christmas and may the wind be at your back (and not too strong!). Have a Merry Christmas, Sue and crew and do your own thing!!! That photo of Spike and Louie is priceless, Sue. It resulted in my first laugh of this fine Chicago-area day! Thanks again for your fantastic reportage and wonderful photos, and have a very merry Christmas! You’re welcome, Kim. Gee, I feel guilty whining about wind and cold (and Spikey should feel guilty, too!) when there are people who live in places like the Chicago area. God help you. I couldn’t do it. Merry Christmas! I totally understand where you are coming from. I will be spending Christmas alone this year, much to the dismay of my friends and fellow campers. I really would rather spend it alone than spending it in someone else’s holiday scene, like a movie I don’t belong in. I have plans to read & relax & may have to get stern with some as well. I ticked a lot of people off with my recent digital sabbatical, so at least I’ve broken the ice in that department! One of my best Christmases was alone with Bridget and Spike. I lit a few candles, read the Christmas story from the Gospel according to Luke, and went to bed. No commercial Christmas crap to put away . . . sweet and simple. I hope you have a Merry Christmas, Ms. M! You say ‘next stop Yuma’. It is doubtful that I’ll cross paths with you but I’m at the Kofa Escapee Park southeast of the downtown area. If you happen to be down that way stop by and say hello. If I think I’ll be over that way, I’ll email you and give you some warning. I’d like to meet you, too, Ed. I almost visited you in Ajo and then I got a Hermit Attack and didn’t. Gonna stay at the pond in Ajo this year Sue? Wherever you and the crew end up I know you will tell us about it, we count on it. Best wishes for a nice Christmas. We’re leaving for California to spend the holiday with the Grand-kids. I think you mean the pond at Yuma? No, I don’t think so. Have a safe trip and enjoy your grandchildren! The wind is the one thing that can drive you out of Borrego…and of course the itch to move. Good travels to you!! We’ll be following along on the blog. P.S. Nice shot of the doggies…captured!! Hi Nina…. I saw a break in the wind and figured we’d better git while the gittin’ was good. Our last night there was so cold! Sue, I wanted to wish you and the crew a very Merry Christmas. I hope you enjoy your new year in Ajo. Such a peaceful, quiet place. Usually warm, as compared to what I remember of the Cambridge, winters. Brrrrr……!!! Thank you, Joan. And a Merry Christmas to you, too! Merry Xmas Sue…………..thanks for the card !! Spike and Bridget with Santa is so precious!! Now it is out with the Google maps to follow your next adventure and to continue my education of the US ! Love and hugs for you and your very special crew…………..from down under !!! I’m so proud to have a reader in Australia. Thanks for all your comments and kind words this past year, Glenda. Have a wonderful Christmas! Hi Doris! Sounds like maybe you’ve had the annual Christmas photo experience. Happy to give you a laugh! The crew and I arrived safely at our new camp in the Ogilbie Road area, a few miles west of Yuma. I’ll write tomorrow about leaving Borrego Springs and setting up our new camp. It’s been a good day! Wouldn’t my rig — both the PTV and the BLT — look cute painted camo! Ha! I know you appreciate your privacy and then it is nice to meet people when in town. Bless you and Timber, too. Stay warm and healthy this winter. Rusty & Timber, Wishing the two of you a Merry Christmas and many happy adventures in the New Year! Your always in my thoughts and prayers for safety and happiness!! All I do is write about my life with the crew, the places we go, the people we meet. I’m thrilled to hear you get that much out of my blog. Thank you for telling me. I appreciate your sweet holiday message. I wish you a Merry Christmas and Joyful New Year! Wishing you and the pups a very Merry Christmas. Thanks for the pictures. Hoping you have safe travels and a New Year filled with happiness and contentment. Thank you, Karen! I wish you safety and warmth in Minnesota, and happy holidays! Merry Christmas to you and the crew, Sue! I’ve been out of town the past week, so I spent this morning catching up with your recent adventures. I know what you mean about enjoying spending time alone, especially at the holidays. My mother always wants me to come visit her, thinking that spending Christmas alone is sad, but I actually enjoy it. I get a pizza the day before, sleep late, cook the pizza, then spend the day with my dog Oliver enjoying the peace and quiet and no comitments or obligations. I think your idea of an enjoyable Christmas is very nice, especially when you have Oliver with you. The part about no commitments or obligations is important. Enjoy your Christmas, Cari!